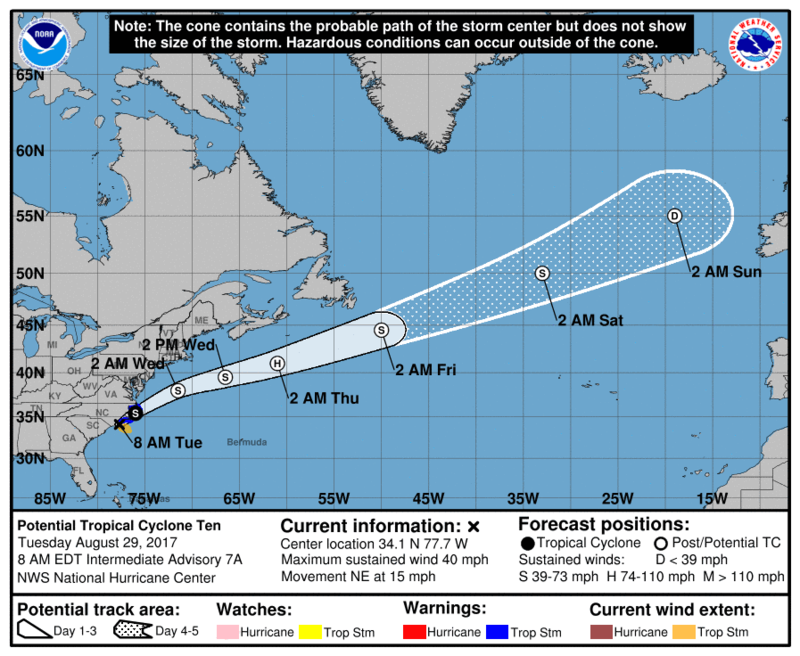 MIAMI, Florida - NOAA's National Hurricane Center in Miami, Florida issued a Public Advisory at 8 p.m. Eastern Daylight Time on Tuesday, August 29, 2017, due to the presence of Potential Tropical Cyclone Ten. Potential Tropical Cyclone Ten, also known as Invest 92L, has maximum sustained winds of 45 mph (75 km/h), with higher gusts. NHC forecasters say that Invest 92L is forecast to strengthen at sea and become a hurricane-force extra-tropical low over the northwestern Atlantic Ocean by Wednesday evening. Potential Tropical Cyclone Ten is located 85 miles northeast of Cape Hatteras, North Carolina and is moving toward the northeast near 15 mph (24 km/h). NHC forecasters say that a east-northeast direction with a gradual increase in forward speed is expected during the next couple of days. On the forecast track, Invest 92L will move near or over the coast of North Carolina today before moving out to sea. RAINFALL: The system is expected to produce total rain accumulations of 1 to 3 inches from the southeast Virginia coast into the Delmarva through Wednesday. The heavier rains may result in some flooding concerns along coastal areas. WIND: Strong winds, with gusts up to 55 mph, are expected across coastal portions of northeastern North Carolina, southeastern Virginia, and the eastern shore of Virginia and Maryland through this evening. SURF: Swells generated by this disturbance will affect portions of the North Carolina and Virginia coasts during the next day or so, creating dangerous surf and rip current conditions.